A perennial favorite with educators, The Giver has been widely taught in schools since its publication in 1993. Over the years, Lois Lowry’s dystopian classic has inspired the creation of countless thought-provoking classroom activities for students. We’ve rounded up a few of our favorites below. As a class, compile a list of some of the jobs members of the Community are assigned at the Ceremony of Twelve. Place each assignment in an envelope and have students pick one at random. Ask each student to complete a job application for the position they received, including the traits and qualities they feel the ideal candidate would possess. As a class, come up with a list of common emotions—anger, fear, joy, excitement, etc. Ask students to compile personal memories they associate with each emotion in a journal. 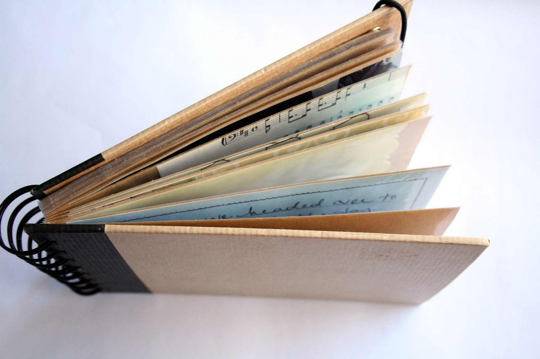 Students might choose to include photos or drawings along with their written memories. Have each student choose a memory to “transfer” to the class, paralleling how the Giver transfers memories to Jonas. Discuss as a group whether there are any memories they might choose to forget, if it meant they would also forgo the emotions associated with the event (shame or trauma, for example). 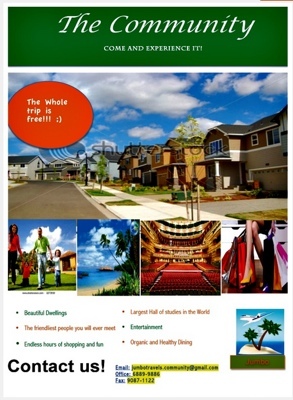 Have students use multimedia tools and persuasive language to design a travel brochure for the Community. Students should consider aspects of Community life that might inspire tourists to visit, or families to relocate there. For example, they might include information on the local economy, government, schools, climate, transportation system and job opportunities. Have students work in teams to create 90-second video adaptations of The Giver to submit to the Newbery Film Festival. Rather than try and cram every detail of the story into a minute-and-a-half, students should explore ways to add their own creative flair to the narrative. For more information about the festival, click here. 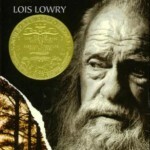 The iconic cover of The Giver features a photo taken by Lois Lowry of an old man she met while researching an article in Maine. 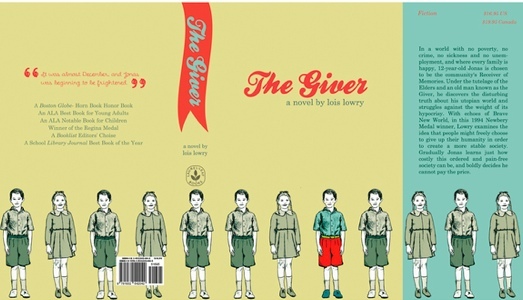 In her 1994 Newbery acceptance speech, Lowry told the story of how the man served as her inspiration for the character of the Giver. “In the summer of 1979, I am sent by a magazine I am working for to an island off the coast of Maine to write an article about a painter who lives there alone. I spend a good deal of time with this man, and we talk a lot about color. It is clear to me that although I am a highly visual person – a person who sees and appreciates form and composition and color – this man’s capacity for seeing color goes far beyond mine. I photograph him while I am there, and I keep a copy of his photograph for myself because there is something about his face – his eyes – which haunts me. Later, I hear that he has become blind. As a class, talk about the emotions Lowry’s cover evokes. 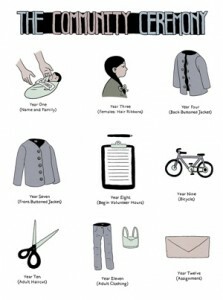 Next, consider some of the elements of a successful book cover. Does it draw the reader in without revealing too much of the plot? Does it stand out on the shelf? Ask each student to design their own book cover for The Giver around an aspect of the story that resonated with them. Hang sheets of different colored paper around the room, with a notepad next to each color. 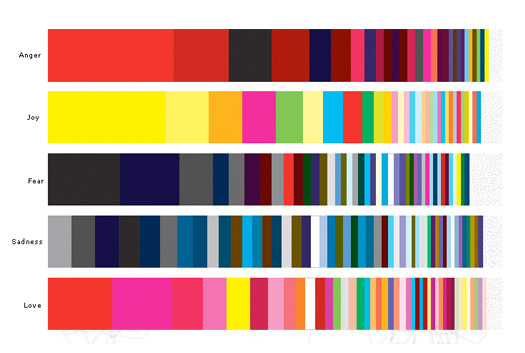 Have students spend 30 seconds at each color, writing down the emotions the color inspires in them. When the time is up, have the students shift to the next color station. After everyone has rotated through each station, review with the class the emotions inspired by each color. Were they consistent? Discuss why certain colors may have inspired negative emotions, while others inspired positive emotions. 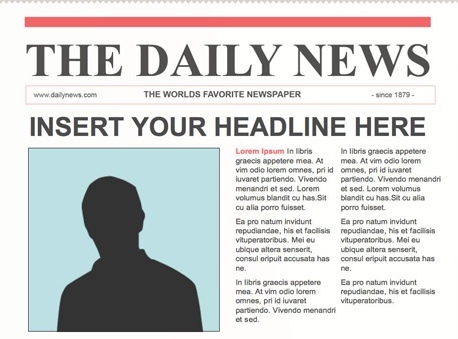 Have the class create a newspaper for the Community, following a traditional front page layout. What sort of news might make the headlines? Consider the implications of “news” in a culture of Sameness. Check out Amber’s latest, most up to date resources for her The Giver unit at her Flexible Classroom website. Scroll down to The Giver/Utopia section. Lois Lowry’s The Giver has always been a teacher favorite, but this year there is the added bonus that the movie was released alongside other movie adaptations of dystopic novels such as Divergent and Catching Fire. Students are aware, more than ever, of the potential for social discord and the implications that it may have for their own lives if government goes unchecked. I began our unit by introducing our “big project” that we’d be doing at the end. I’ve taken to doing this so that students are able to identify their purpose for reading. Yes, we’d be taking a test. Yes, we’d be writing about the novel. But, they were also tasked with forming a “committee” to create a Community of their own that they would then present to their peers. One of the concerns I have teaching the novel is that students are not prepared for the true gravity of the topic. Infanticide and eldercide, coupled with genetic engineering that resembles Hitler’s master plan to Aryan-ize the world, are heady topics for 13-year olds. After a few chapters, I asked them to create a travel poster with their resource group, convincing me to live in the Community of the novel. We talked about persuasive language, as well as biased writing. No war, no homeless, no hunger, no orphans, no jobless. Sounds pretty amazing, right? As the novel continued, we returned to our travel posters, gradually discovering the unintended consequences. The work I do with the students on the front side here pays huge dividends in their level of understanding and the quality of the communities they eventually create for their summative assessment. 2) Teach the novel as you normally would, paying close attention to some of the issues that will arise when students create their own Community. 3) Let students figure out responsibilities. Allow them a day to sort out who will handle the individual pieces of the project. I show this student-made video, Paradox of the Perfect World, to inspire them to create the world they’d like while also appreciating what a difficult task it actually is. 4) Carve out some time. Once groups are determined, students need plenty of time to think, research, and produce a viable Utopia and quality presentation. I gave my students 7 days of library time. If you think this sounds ridiculously long, remember that you are facilitating this project and are able to direct discussions, differentiate your expectations, and allow for critical thinking. 5) Build an audience. Invite parents, family members, other teachers, your librarian, and administrators to the presentations. One of my proudest moments this year—when you know you are doing something right—is when I had two students from a study hall ask for a pass to see their friend’s presentation because they had heard all about it. Teaching doesn’t get better than that! 6) Keep the presentation schedule flexible. The team projects take about 15 minutes to present, so I plan for two per day. I also leave a day at the end for all “make-ups” because inevitably there will be someone absent or a lost-jump-drive emergency. One bump: what if a parent shows up to a presentation, but there is someone absent on their child’s team? In my trial by fire—this had never happened before—I had the students do the presentation anyway. When that student’s “part” came up, they were to divvy up the information to be explained. After all, they had been working collaboratively for weeks. This made the group incredibly nervous, but they rose to the occasion, also teaching them the valuable lesson that “the show must go on.” They were then allowed to come to my study hall and present to students there so that even the absent child had the opportunity for a true audience. It was also very fun for my study hall of seventh graders to get a preview of what they would be doing in 8th grade. The 8th grade presenters were proud and even answered questions. I won’t kid you—this was an intensive project, and we left it a little out of breath. So, what did the kids want to do when they needed a break? They begged to watch the movie. This presented a problem for me, as I don’t normally show entire movies, and I never show PG-13 ones. At first I said no. To be honest, it seemed like more trouble than it was worth. However, I decided I’d look into the rating because that was the number one thing holding me up. I found that the rating was due to the topic, not the content per se. I had seen the movie and had not had any concerns, but I wanted to be sure. After a little trepidation, I sent home the permission slips. Miraculously, they all came back! Isn’t it funny how it works that way? Well, today we just finished up the movie. I have to say that I am thrilled that their begging paid off. The rich conversations that we are having comparing the movie with the book is really exciting for me, and, I think, for them. They’ve never really done critical analysis of a movie compared to a book. And, then it occurred to me—and I’m sure I’m supposed to say I planned it this way—that this activity had met Standard RL7.7: Compare and contrast a written story, drama, or poem to its audio, filmed, staged, or multimedia version, analyzing the effects of techniques unique to each medium (e.g., lighting, sound, color, or camera focus and angles in a film). It isn’t that I’ve never done this type of thing before, but I think that I always jumped the gun—showing the movie when they may not have engaged as deeply with the text as we did with The Giver. With five minutes left until Spring Break, I asked my students if they thought I should start next year with this unit. Antsy 8th graders were eager to tell me, emphatically, yes. It was much more interesting when a grown-up was explaining things and helping them to understand. I love curriculum and themes and essential questions as much as any other teacher; however, I can’t help but believe that my bigger calling is to help students connect these dots and become people who think about the world in new ways.